Solidarity (Solidarność, IPA: [sɔli'darnɔɕt͡ɕ]; full name: Independent Self-governing Trade Union "Solidarity," Niezależny Samorządny Związek Zawodowy "Solidarność," IPA: [ɲeza'lɛʐnɨ samɔ'ʐɔndnɨ 'zvjɔ̃zɛk zavɔ'dɔvɨ sɔli'darnɔɕt͡ɕ]) is a Polish trade union federation founded in September 1980 at the Gdańsk Shipyard, and originally led by Lech Wałęsa. Solidarity was the first non-communist trade union in a Communist country. In the 1980s, it constituted a broad anti-communist social movement. The government attempted to destroy the union during the period of martial law in the early 1980s and several years of repression, but in the end it had to start negotiating with the union. The Roundtable Talks between the government and Solidarity-led opposition led to semi-free elections in 1989. By the end of August, a Solidarity-led coalition government was formed and in December Lech Wałęsa was elected President of Poland. The success of Solidarity played a significant role in the collapse of the Soviet empire in Eastern Europe and the Revolutions of 1989. Since the collapse of communism in Eastern Europe in 1989 it has become a more traditional trade union. 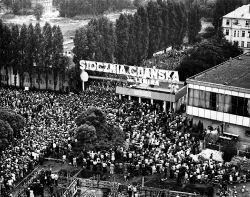 1980 strike at Vladimir Lenin Shipyard, Gdańsk, in August 1980, birthplace of Solidarity. Solidarity was founded in September 1980 at the Lenin Shipyards, where Lech Wałęsa and others formed a broad anti-communist social movement ranging from people associated with the Catholic Church to members of the anti-communist Left. Solidarity advocated nonviolence in its members' activities. In September 1981, Solidarity's first national congress elected Lech Wałęsa as a president and adopted a republican program, the "Self-governing Republic." The government attempted to destroy the union with the martial law of 1981 and several years of repression, but in the end it had to start negotiating with the union. The survival of Solidarity was an unprecedented event not only in Poland, a satellite state of the Soviet Union ruled (in practice) by a one-party Communist regime, but the whole of the Eastern bloc. It meant a break in the hard-line stance of the communist Polish United Workers' Party, which had violently ended a 1970 protest with machine gun fire (killing dozens and injuring over 1,000), and the broader Soviet communist regime in the Eastern Bloc, which had quelled both the 1956 Hungarian Uprising and the 1968 Prague Spring with Soviet-led invasions. Solidarity's influence led to the intensification and spread of anti-communist ideals and movements throughout the countries of the Eastern Bloc, weakening their communist governments. In Poland, the Roundtable Talks between the government and Solidarity-led opposition led to semi-free elections in 1989. By the end of August a Solidarity-led coalition government was formed and in December Tadeusz Mazowiecki was elected Prime Minister. In December 1990, Wałęsa was elected president. This was soon followed by the dismantling of the People's Republic of Poland, and the creation of the non-communist, democratic Third Polish Republic. These limited elections, where anti-communist candidates won a striking victory, sparked off a succession of peaceful anti-communist counterrevolutions in Central and Eastern Europe. Solidarity's example was, in various ways, repeated by opposition groups throughout the Eastern Bloc, eventually leading to the Eastern Bloc's effectual dismantling, and contributing to the collapse of the Soviet Union, in the early 1990s. Since 1989, Solidarity has become a more traditional trade union, and had relatively little impact on the political scene of Poland in the early 1990s. A political arm founded in 1996 as Solidarity Electoral Action (AWS) won the parliamentary election in 1997, but lost the following 2001 election. Currently Solidarity has little political influence in modern Polish politics. In Solicitudo Rei Socialis, a major document of Catholic Social Teaching, Pope John Paul II identifies the concept of solidarity with the poor and marginalized as a constitutive element of the Gospel and human participation in the common good. The Roman Catholic Church, under the leadership of Pope John Paul II, was a very powerful supporter of the union and was greatly responsible for its success. In addition, the priest Jerzy Popiełuszko, who regularly gave sermons to the striking workers was eventually killed by the Communist regime for his association with Solidarity. Formed in 1981, the union's supreme powers were vested in a legislative body, the Convention of Delegates (Zjazd Delegatów). The executive branch was the National Coordinating Commission (Krajowa Komisja Porozumiewawcza), later renamed the National Commission (Komisja Krajowa). The Union had a regional structure, comprising 38 regions (region) and two districts (okręg). During the communist era, the 38 regional delegates were arrested and jailed when martial law came into effect in 1983 under General Jaruzelski. After a one-year prison term the high-ranking members of the union were offered one way trips to any country accepting them (Canada, United States, South Africa, Germany, Switzerland). Currently, Solidarity has more than 1.1 million members. National Commission of Independent Self-Governing Trade Union is located in Gdańsk and is composed of Delegates from Regional General Congresses. Solidarity played a major role in the collapse of Communism, leading first to the Revolutions of 1989 in Eastern Europe, and then later to Collapse of the Soviet Union in 1991. The fall of the Communist regime marked a new chapter in the history of Poland as well as in the history of Solidarity. Having defeated the communist government, Solidarity found itself in a role it was much less prepared for, that of a ruling political party. Soon after, Solidarity's popularity began eroding. Conflicts between various factions inside Solidarity intensified. Wałęsa was elected the chairman of Solidarity, but his support eroded. In December, Wałęsa was elected president, resigning from his post in Solidarity and becoming the first President of Poland elected by popular vote. The survival of Solidarity was an unprecedented event not only in Poland, a satellite state of the USSR ruled, in practice, by a one-party Communist regime, but the whole of the Eastern bloc. It meant a break in the hard-line stance of the communist Polish United Workers' Party, which had bloodily ended a 1970 protest with machine gun fire (killing dozens and injuring over 1,000), and the broader Soviet communist regime in the Eastern Bloc, which had quelled both the 1956 Hungarian Uprising and the 1968 Prague Spring with Soviet-led invasions. Solidarity's influence led to the intensification and spread of anti-communist ideals and movements throughout the countries of the Eastern Bloc, weakening their communist governments. The 1989 elections in Poland where anti-communist candidates won a striking victory sparked off a succession of peaceful anti-communist revolutions in Central and Eastern Europe known as the Revolutions of 1989 (Jesień Ludów). Solidarity's example was in various ways repeated by opposition groups throughout the Eastern Bloc, eventually leading to the Eastern Bloc's effectual dismantling, and contributing to the collapse of the Soviet Union, in the early 1990s. ↑ 1.0 1.1 Manfred B. Steger, Judging Nonviolence: The Dispute Between Realists and Idealists (Routledge, 2004, ISBN 0415933978), 114. ↑ Paul Wehr, Guy Burgess, and Heidi Burgess (eds. ), Justice Without Violence (Lynne Rienner, 1993, ISBN 1555874916), 28. ↑ Piotr Gliński, The Self-governing Republic in the Third Republic, “Polish Sociological Review,” 2006 (1). Eringer, Robert. 1982. Strike for Freedom: The Story of Lech Walesa and Polish Solidarity. Dodd Mead. ISBN 0396080650. Garton Ash, Timothy 2002. The Polish Revolution: Solidarity. Yale University Press. ISBN 0300095686. Kaminski, Marek M. 2004. Games Prisoners Play. Princeton University Press. ISBN 0691117217. Kenney, Patrick. 2003. A Carnival of Revolution: Central Europe 1989. Princeton University Press. ISBN 069111627X. Kenney, Patrick. 2006. The Burdens of Freedom. Zed Books Ltd.. ISBN 1842776622. Kubik, Jan. 1994. The Power of Symbols Against the Symbols of Power: The Rise of Solidarity and the Fall of State Socialism in Poland. The Pennsylvania State University. ISBN 0271010843. Osa, Maryjane. 2003. Solidarity and Contention: Networks of Polish Opposition. University of Minnesota Press. ISBN 0816638748. Ost, David. 2005. The Defeat Of Solidarity: Anger and Politics in Postcommunist Europe (ebook). Cornell University Press. ISBN 0801443180. Penn, Shana. 2005. Solidarity's Secret: The Women Who Defeated Communism in Poland. University of Michigan Press. ISBN 0472113852. Perdue, William D. 1995. Paradox of Change: The Rise and Fall of Solidarity in the New Poland. Praeger/Greenwood. ISBN 0275952959. Staniszkis, Jadwiga. 1984. Poland's Self-Limiting Revolution. Princeton University Press. ISBN 9780691094038. Weigel, George. 1992. The Final Revolution: The Resistance Church and the Collapse of Communism. Oxford University Press. ISBN 0195166647.